The incidence of asthma varies in various countries, but there is a tendency that the number of sufferers of this disease is increasing. The National Health Interview Survey in the United States estimates that at least 6.5 million people there suffer from one form of asthma. WHO also mentioned in the World Health Report that asthma is among the five major lung diseases in the world. 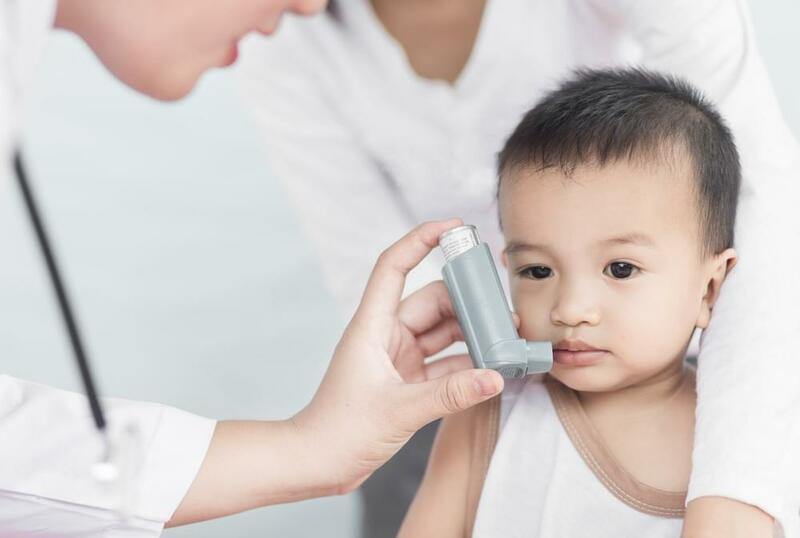 Experts conclude that the increase in the incidence of asthma is not only due to higher hygiene standards, but also because of the increasing number of air pollution such as dust, vehicle smoke, and cigarette smoke. Increased standardization of hygiene makes the immune system of the Little One who grew up with way too hygienic environment does not get "exercise" to deal with germ infections, so that his/her immune system is more channeled to respond to allergic reactions. Your Little One often coughs, especially when playing, at night, and when laughing or crying. Your Little One is tired quickly while playing. Your Little One experiences shortness of breath or breathes quickly. Your Little One often makes a "wheezing noise" when exhaling. Your Little One often has recurrent bronchitis (inflammation of the respiratory tract). Having a low birth weight, less than 2500 grams. There is a family history of allergies. Have other allergies, such as allergic rhinitis, atopic dermatitis, and others. Exposure to cigarette smoke, both during pregnancy and after birth. If your Little One has one or more of the symptoms above, consult your doctor. The doctor will check your Little One to ensure a diagnosis of asthma. Symptoms of asthma can worsen, therefore early diagnosis becomes very important so that your Little One can be treated more quickly. Usually the doctor will give medication to relieve also control the symptoms of asthma so that it is not easy to relapse. For Little Ones who are toddlers, the treatment generally given is in the form of evaporation, with or without drugs. Nebulizer can help Mommy to relieve a cold or asthma on your Little One. The physiological saline solution which is evaporated can thin mucus and phlegm. The next thing that needs to be done by Mommy is to look for the trigger factor for your Little One to get asthma. The trigger can vary, including food, dust, air temperature to emotions. Avoid trigger factors so that the asthma does not recur. If the Little One’s Asthma is easy to relapse due to fatigue or overheating, tell the Little One’s Teacher about the condition. He/she may get a dispensation for certain activities. In addition, support the Little One’s immune system by giving him/her a nutrient-rich food. Give nutrients that contain lactoferrin and nucleotides that can strengthen the immune system to fight diseases and infections. Nucleotides will strengthen the immune system and support the health of the digestive system. Healthy digestion will make absorption and distribution of nutrients run optimally so that your Little One has a good metabolism. Lactoferrin works on white blood cells to provide immunity. This means, if the needs are met, lactoferrin will prevent the Little One from experiencing more severe respiratory tract infections caused by viruses and bacteria. Your little one might be more vulnerable to sickness than you. It is because his immune system is not yet mature. There are lots of factors that may cause your child to get sick, among others is viral or bacterial infection. After the presence of the Little One in the family, Mommy must be diligent in seeking information, especially about the stage of growth and development of your Little One. Well, walking is usually one of the long-awaited achievements. Walking is one of the basic motor skills that will be mastered Little. Generally, this ability can be done Little when he stepped on 8-12 months, he will do so while holding the edge of the wall or creeping.